“Complex Event Processing, or CEP, is primarily an event processing concept that deals with the task of processing multiple events with the goal of identifying the meaningful events within the event cloud. When the average price of a stock falls below $25 over any 5 minute period, then sell. When 2 transactions happen on an account from radically different geographic locations within a certain time window then report as potential fraud. When a gold customer's trouble ticket is not resolved within 1 hour, then escalate. When a team meeting request overlaps with my lunch break, then deny the team meeting and demote the meeting organizer. When talking to people about CEP the second question they ask is, “aren't CEP statements just rules?” The first being “What's CEP?”. They struggle to understand why we have two separate industries and approaches to what appears on the surface to be the same – i.e. when some scenario/situation in your data is detected, do something. The reason for this is simple... they are right. Let me explain why <tongue in cheek>CEP is the industry that never should have happened</tongue in cheek>. While CEP has become the adopted term for this industry, there is some general concern about it's inappropriateness, just google for “Tim Bass” and you'll see plenty of comments on this. CEP is in actuality a huge research area and many CEP products, including Drools, only touch a fraction of what is possible. 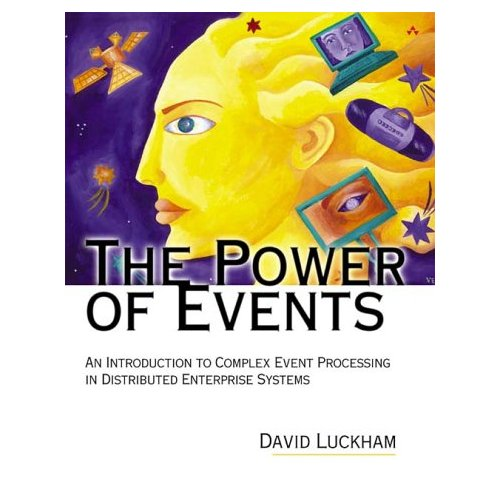 David Luckham's book “The Power of Events: An Introduction to Complex Event Processing in Distributed Enterprise Systems” is considered the “bible” on this subject and shows how indeed we are only just scratching the surface. I had the luck to be at RuleML2008 where David was a keynote speaker, which was very inspirational. Tim Bass has a nice presentation on this subject “Mythbusters: Event Stream Processing v. Complex Event Processing”. While most of the industry is actually ESP, for continuity I'll continue to refer to it as CEP throughout this article. So now back to the subject “CEP is the industry that never should have happened”. Over ten years ago ILog introduced the event management and alarms capability into their flagship rule engine product, and things where good, this really was cutting edge stuff for a mainstream product at that time. This allowed for temporal event correlation, as a natural extension to their existing rule language, with fully managed life cycles; so the user didn't have to worry about retracting all their objects and the engine memory blowing up. This wasn't a separate engine, it was an integral part of their existing engine. The same way that truth maintenance or other advanced features are part of the engine. ILog had some high profile customers and rapid growth in the telecoms market, which was the target market for this functionality. At the same time they also had a whole host of really interesting products as the result of ongoing artificial intelligence (AI) research. At the Business Rules Forum 2008 (BRF08) I had the pleasure of spending some time with the ILog guys – it's great when we can put the marketing and competition to one side, and just chat as engineers. We talked about all the really cool things that ILog R&D had produced, but have had to trim back, or put on hold, over the last 15 years, as business focuses changed. It was all fascinating stuff. So what happened? Two things. The AI winter happened where some of the hype cooled, as reality hit. It became obvious that while interesting some of these things only worked well in a very narrow scope, making it hard to build a growing business around. While event management did have a strong and broad benefit the AI winter was shortly followed by the telecoms downturn and spending on research and new IT projects was vastly reduced. As the telecoms downturn set in, Business Rules started to emerge and a change in company focus happened as they realized the financial potential. Rather than pushing for more AI features, the push was more for simplification aimed at something business analysts can use for business automation and decision management. Slowly the advanced AI features were put on pause, slimmed down or removed. Apparently many cool features are still retained in the capabilities of the engine today, but just not exposed to the end user. The event management was put into maintenance and while it's still in the product today, it is no longer the cutting edge of technology that it once was. Fast forward to 2009 and CEP is now everywhere, everyone understands it, wants and needs it. A whole new industry has grown out of this with companies such as TIBCO, StreamBase and EsperTech. Many of the CEP companies denounce rule engines, and the Rete algorithm especially, as out dated technologies and not suitable for CEP, promoting their own specialist algorithms. These systems tend to be based around an extended SQL, called “Streaming SQL” that detects event patterns in streams and executes actions. These tools do not tend to offer inferencing or provide capabilities for reasoning over sets of data, such as that found in a decision table. TIBCO, one of the main players on the field, unlike many of their rivals do implement their technology on an enhanced Rete algorithm and able to offer full rule engine capabilities, beyond just event processing. Part 2 of this article will be a lot more technical showing how Drools, originally a Rete based rules engine, was easily, cleanly and orthogonally extended as a platform for (complex) event processing. Hate to jump in here with negative comments about a product, but I'd hardly call TIBCO's rete implementation 'enhanced' or to have 'full rule engine capabilities'. In fact, in that regard, it's call it barely adaquate. It's often very fustrating to express conditions when you don't have expressions as basic as a 'not' or existential operators. Don't get me wrong, there are somethings it does very well indeed, but as far as rete goes, it's got a lot of catching up to do just to be adequate. I can't vouch for the quality or individual features of TIBCO BE never being used it myself for real, but the truth is that their general vision does emphasize the concept of an integrated platform capable of processing both rules and events. They were also one of the first in the market to do that, and for that I commend them. In a sense, it is good to know that we are not alone in this vision. Although, Drools goes a step further, adding support to Processes as first class citizens in the same platform, as we believe these are all facets of the same problem, and all within the universe of problems better solved by a seamless declarative approach. I'll help Steve with some answers on TIBCO BusinessEvents over in the TIBCOmmunity or CEP blogs, as its hardly appropriate to explain non-Drools approaches and features in the Drools blog! Please don't take my comments as casting a negative light on BE, as I said it's a great product in many ways, especially in the function catalog and integration capabilities, but the lack of full first order predicate logic can make expressing rules a bit awkward at time. Ping me sometime if you need any help in adding this (or other ideas) to your rule engine; it is non-trivial. Look how many versions it took many competitors to get it right! Thanks for referencing my DEBS presentation "Mythbusters" and for mentioning me twice in your post. I appreciate your references and thoughtfulness. I wish there was something new to report in this area; or that I had some keen insight to share. I don't, unfortunately. My main thoughts, which are a random rerun of much of my earlier comments is that CEP, "the movie" was a great idea when it was DARPA funded DoD research. The DOD was attempting to further the state-of-the-art of the needle-in-the-haystack detection problem. Then, the upstart rule-oriented (stream processing) vendors saw that CEP, the marketing term, was getting a lot of attention, so they repositioned their rule-processing technologies as CEP. Their software was not mature enough to position themselves as a BRE or BRMS - to do that would mean they would have to fight for space on the Gartner "Magic Carpet." After marketing hype dominated the technology dialog, little seems to been accomplished by the same people to further the state-of-the-art of solving complex needles-in-many-haystacks problems. Because the marketing weenies dominated the badly needed technical discussion, my interest in the topic has obviously receded. The promise of CEP, at least as DOD DARPA originally envisioned it (and yours truly as well), remains elusive; progress is being made but not by most vendors calling their software "CEP"; selling in traditional software cash-cow banks as algorithmic trading platforms dominates the airwaves. I suspect the future of actually processing complex events will not be so tightly coupled with the CEP TLA. BTW, I agree with the theme of your post, "Complex Event Processing (CEP) - The industry that never should have happened" and look forward to reading more.